This Cranberry-Walnut Sweet Potato Hash will have your guests forgetting all about the traditional sweet potato casserole. It’s loaded with dried cranberries, toasted walnuts, and, everyone’s favorite, bacon! Thanksgiving is everything I love about the holiday season. A huge buffet loaded with endless amounts fall-inspired dishes without the headache or stress of gift giving—it’s a win-win situation. What really excites my family and me at Thanksgiving—nope, not the turkey—are the side dishes. We like to have a variety of dishes to choose from. One or two just won’t cut it, so I go a bit over the top when it comes to creating my menu. The one dish that causes my family to revolt and become outraged if it doesn’t make an appearance is my sweet potato casserole. It’s absolutely delicious, but also extremely predictable, so this year I’ve decided to blow their minds a bit and introduce a new, re-invented sweet potato dish. This Cranberry-Walnut Sweet Potato Hash has been family tested and approved. Smoky bacon, sweet cranberries, and toasted Diamond Walnuts get tossed with crispy pan-fried sweet potatoes for a Thanksgiving win! The lovely thing about this dish is that it comes together in 30 minutes and won’t take up any space in your over-worked oven on the big day. I love marshmallows as much as the next gal, but I prefer them on a s’more and not on top of my sweet potatoes. I know a lot of you are huge fans of the marshmallow-sweet potato combo, but I find it cloying sweet and unappetizing. 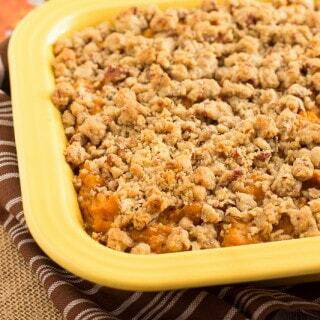 However, if sweet potato casserole is a must have, try this Pecan Streusel Topped Sweet Potato Casserole this Thanksgiving. My family goes crazy for it every year, but this year they’re going crazy for this hash. Because I didn’t want to hear them whine and cry this year, I warned them about the change and let them try the dish before the big day. They all agreed that it would be okay–just this once–if we swapped sweet potato dishes. Honestly, what’s not to love about sweet potatoes, smoky bacon, cranberries, and toasted walnuts? It’s a pretty epic combination of flavors and textures. This sweet and savory hash is loaded with crisp sweet potatoes, sweet cranberries, smoky bacon, and toasted walnuts. Cook bacon in a large sauté pan over medium-high heat until crispy, about 7-10 minutes. Using a slotted spoon, transfer the bacon to a paper towel-lined plate; set aside. Reserve 2 tablespoons of bacon grease, discarding the rest. Turn the heat down to medium and add the sweet potatoes to the pan with the reserved bacon grease. Cook, stirring occasionally, for 10 minutes. Try to refrain from stirring the potatoes too often so they have a chance to become crispy. Add the onions and red pepper flakes to the pan with the sweet potatoes. Continue to cook, stirring occasionally, for 8 minutes. Stir in the garlic and chopped thyme; cook, stirring often, for an additional 2 minutes, or until the garlic is fragrant and sweet potatoes are tender. Remove the pan from the heat and season with salt and pepper to taste. Stir in the cranberries, toasted walnuts, and bacon. Garnish with sliced scallions. To me I look at this as the perfect breakfast hash! It is just yelling to be in my hands right now! I’m with you, the sides are the winners on our Turkey day table too. I can totally see this any time of year with a drizzly egg on top any time of the day! I agree completely. Turkey is nice, but it’s really about the multiple side dishes that you get to fill your plate with! Love this one! Love a good hash – especially the crispy edges! OMG the morning after, put an egg on this and I’ll be in heaven!! I totally see this topped with some eggs on it the day after! I love this hash and absolutely prefer over any traditional marshmallow topped sweet potato dish. Sweet potato hash is always amazing. I often add balsamic vinegar but I’m loving the idea of cranberries, nuts and bacon.